In August 2007, Gordon Fell set an Australian property record, shelling out $28.7 million for a house on the harbour in Point Piper. The transaction was yet to settle. Along with Allco founder David Coe, Fell had turned thin air and a bunch of blue-blood connections into $6 billion in book value in a little over three years. As a feat of financial engineering, his labyrinthine Rubicon property empire was stupendous: surpassing Allco, its rival Babcock & Brown and even the godfather of paper shuffling itself, Macquarie Bank, for sheer speed and chicanery. Here they were, the greediest of the greedy. And now their big pay-day loomed. In late October, Allco – on whose board Fell also sat – unveiled its fateful $330 million acquisition of Rubicon. Besides a slew of Allco shares, Coe, Fell and their junior partner Matthew Cooper stood to rip out $63.7 million cash for something which would soon be a smoking ruin. Fell’s portion was $28.6 million, the price of his new house. But there was a problem. Allco shares were plunging, Rubicon was struggling to refinance its Japan property trust and its three listed Rubicon trusts were under pressure. Though Allco shareholders had no inkling at the time, it emerged in evidence in court this week that another entity in the Rubicon melange was getting margin calls over its holdings in the trusts. The bankers were knocking on Allco’s door, too. Two days before the Rubicon deal completed on December 20, the foundering Allco share price triggered a review event over the loan covenants. Fell had instructed his lawyers to bring forward the settlement date. He settled on his house on January 8. The next day, Allco breached again. A few days later, on January 22, its shares halved. The price of the Rubicon trusts had halved over the previous month. Things unravelled quickly from there. And now the liquidators from Ferrier Hodgson, on behalf of Allco’s bankers who are owed $660 million, are threatening to take Fell’s mansion off him. Just after 3.30 on Thursday afternoon this week, proceedings in the liquidator’s examination of Gordon Fell were adjourned. Fell had been in the witness box all day, prefacing every answer with “privilege” on the off-chance the evidence could be used against him later if the regulators or litigation funders were to come after him. Fell had been earmarked for two days in the box. David Coe had been scheduled to appear on Monday. No longer. A phone call was made. Now it looks like a deal will be thrashed out behind closed doors. Presumably the liquidators, having applied a day of public pressure, had what they wanted. They had produced a trove of damning emails. Rubicon’s own bankers were warning Fell about the credit market collapse in July 2007. The same bankers led by Credit Suisse’s David Dixon also advised Allco on the purchase of Rubicon. KPMG had valued Rubicon at one quarter of the “independent” Grant Samuel valuation used to justify the Allco acquisition – also one quarter of the actual sale price. And the KPMG valuation was struck in early 2007 before the credit market meltdown. Fell showed David Coe a copy of this report but not Allco. Rubicon was making large losses month after month in 2007, according to internal management accounts, but changed its accounting policy to effect a sizeable profit a few weeks before the deal was done. Rubicon was scrambling to refinance a $42 million loan with NAB in December just before its sale to Allco settled. Around the same time Rubicon was busy paying margin calls on cross-holdings in its own trusts. 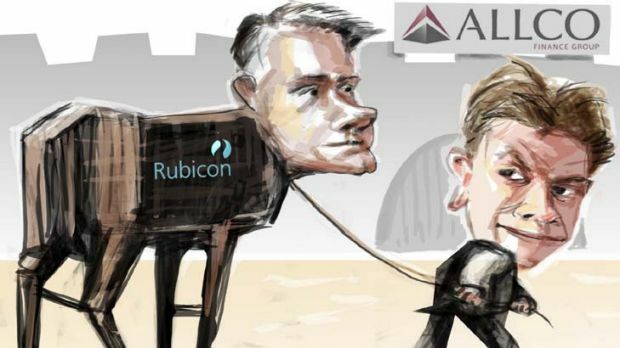 The caper was dubbed “Project Julius”, according to an email from Rubicon’s lawyers, Gilbert & Tobin, advising that it was okay not to tell Allco about the Rubicon margin calls. As far as classical allusions go, Julius Caesar is reasonably apposite. In crossing the Rubicon, Caesar marched on his own city, wreaking great havoc. Thousands were slaughtered. Caesar, like the Rubicon crew, was the master at exploiting the law to suit his interests. His financial leverage also was dangerously excessive. And like Caesar, Fell ruthlessly exploited his patrician peers and backers – PwC as auditors, Credit Suisse and NAB as bankers, Gilbert & Tobin as lawyers and AMP and MLC as early investors. Grant Samuel, as usual, as “independent expert”, has much blood on its toga. And Bell Potter was enlisted to get the plebeians on board. Many a peasant was slaughtered. The more suitable metaphor, however, might be the Trojan Horse. Here was a vehicle engineered to deceive and wheeled into the already crumbling Allco fortress chock-full of the most toxic and gnarly things imaginable. Credit Suisse had used Rubicon as a dumping ground for hundreds of millions of high-risk commercial loans which Rubicon packaged up in its property trusts and palmed off to the hoi polloi after shovelling out tens of millions in fees. The bankers were so happy to get this rubbish off their books they even provided the Rubicon trusts with finance. Deutsche Bank also relieved itself of its toxic loans. Then, of course, Allco bought it all – smack bang at one minute to midnight on the market clock.